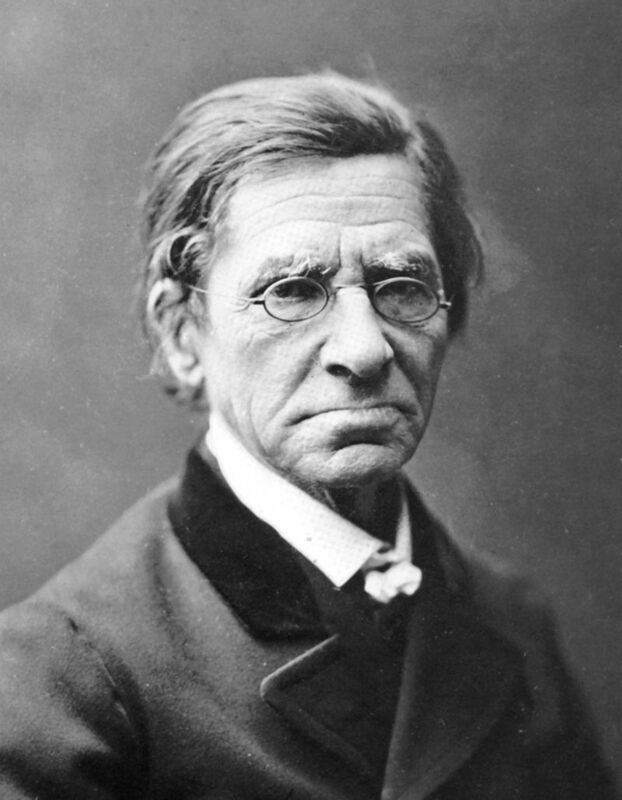 Today is the birthday (1801) of Émile Maximilien Paul Littré , a French lexicographer and philosopher, best known for his Dictionnaire de la langue française, commonly called Le Littré. As a mild coincidence, on this date in 1884, the first volume (A to Ant) of the first edition of the Oxford English Dictionary was published. So it could be Dictionary Day. Littré was born in Paris and studied at the Lycée Louis-le-Grand. He also devoted himself to learning English and German, classical and Sanskrit literature, and philology. Yet he originally decided to become a student of medicine in 1822. He passed all his examinations in due course, and had only his thesis to prepare in order to obtain his degree as doctor when, in 1827, his father died leaving his mother without means. 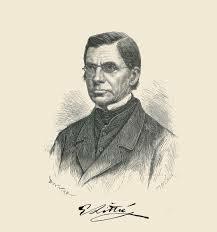 He abandoned his degree at once despite his keen interest in medicine, and, while attending lectures by Pierre Rayer, began teaching Latin and Greek to earn a living. He served as a soldier for the populists during the July Revolution of 1830, and was one of the members of the National Guard who followed Charles X to Rambouillet. In 1831, he obtained an introduction to Armand Carrel, the editor of Le National, who gave him the task of reading English and German papers for excerpts. 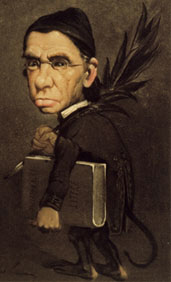 By chance, in 1835, Carrel discovered Littré’s skills as a writer and from that time on, he was a constant contributor to the journal, eventually becoming its director. In 1836, Littré began to contribute articles on a wide range of subjects to the Revue des deux mondes, and in 1837, he married. In 1839, the first volume of his complete works of Hippocrates appeared in print. Due to the outstanding quality of this work, he was elected to the Académie des Inscriptions et Belles-Lettres in the same year. He noticed the works of Auguste Comte, the reading of which formed, as he himself said, “the cardinal point of his life.” From this time forward, the influence of positivism affected his own life, and, what is of more importance, he influenced positivism, giving as much to this philosophy as he received from it. He soon became a friend of Comte, and popularized his ideas in numerous works on the positivist philosophy. He continued translating and publishing his edition of Hippocrates’ writings, which was not completed until 1862, and he published a similar edition of Pliny’s Natural History. After 1844, he took Fauriel’s place on the committee engaged to produce the Histoire littéraire de la France, where his knowledge of the early French language and literature was invaluable. Littré started work on his great Dictionnaire de la langue française in about 1844, which was not to be completed until thirty years later. He participated in the revolution of July 1848, and in the repression of the extreme Republican Party in June 1849. His essays, contributed during this period to the National, were collected together and published under the title of Conservation, revolution et positivisme in 1852, and show a thorough acceptance of all the doctrines propounded by Comte. However, during the later years of Comte’s life, he began to perceive that he could not wholly accept all the dogmas or the more mystical ideas. He concealed his differences of opinion, and Comte failed to recognize that his pupil had outgrown him, as he himself had outgrown his master Henri de Saint-Simon. Comte’s death in 1858 freed Littré from any fear of alienating his master. 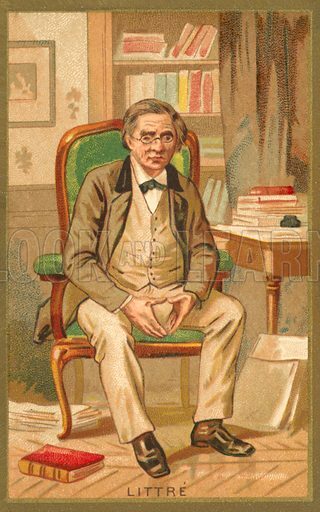 He published his own ideas in his Paroles de la philosophie positive in 1859. Four years later, in a work of greater length, he published Auguste Comte et la philosophie positive, which traces the origin of Comte’s ideas through Turgot, Kant, and Saint-Simon. The work eulogizes Comte’s own life, his method of philosophy, his great services to the cause and the effect of his works, and proceeds to show where he himself differs from him. He approved wholly of Comte’s philosophy, his great laws of society and his philosophical method, which indeed he defended against John Stuart Mill. However, he stated that, while he believed in a positivist philosophy, he did not believe in a “religion of humanity”. About 1863, after completing his translations of Hippocrates and his Pliny, he began work in earnest on his great French dictionary. He was invited to join the Académie française, but declined, not wishing to associate himself with Félix Dupanloup, bishop of Orléans, who had denounced him as the head of the French materialists in his Avertissement aux pères de famille. At this time, he also started La Revue de philosophie positive with Grégoire Wyrouboff, a magazine that embodied the views of modern positivists. Thus, his life was absorbed in literary work until the events that overthrew the Second Empire called him to take a part in politics. He felt himself too old to undergo the privations of the Siege of Paris, and retired with his family to Brittany. He was summoned by Gambetta to Bordeaux to lecture on history, and thence to Versailles to take his seat in the senate to which he had been chosen by the département of the Seine. In December 1871, he was elected a member of the Académie française in spite of the renewed opposition of Msgr. Dupanloup, who resigned his seat rather than receive him. 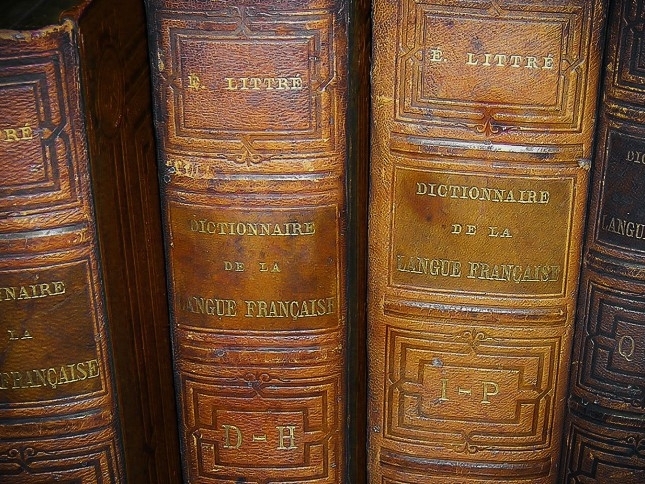 Littré’s Dictionnaire de la langue française (“Dictionary of the French Language”) was completed in 1873 after nearly 30 years of work. The draft was written on 415,636 sheets, bundled in packets of one thousand, stored in eight white wooden crates that filled the cellar of Littré’s home in Mesnil-le-Roi. The landmark effort gave authoritative definitions and usage descriptions to every word based on the various meanings it had held in the past. When it was published by Hachette, it was the largest lexicographical work on the French language at that time. In 1874, Littré was elected senator for life of the Third Republic. His most notable writings during these years were his political papers that attacked and revealed the confederacy of the Orléanists and Legitimists against the Republic; his re-editions of many of his old articles and books, among others the Conservation, révolution et positivisme of 1852 (which he reprinted word for word, appending a formal, categorical renunciation of many of the Comtist doctrines therein contained); and a little tract, Pour la dernière fois, in which he maintained his unalterable belief in the philosophy of materialism. 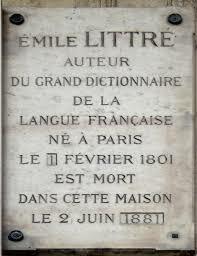 Littré died in 1881 and is interred at Montparnasse Cemetery. 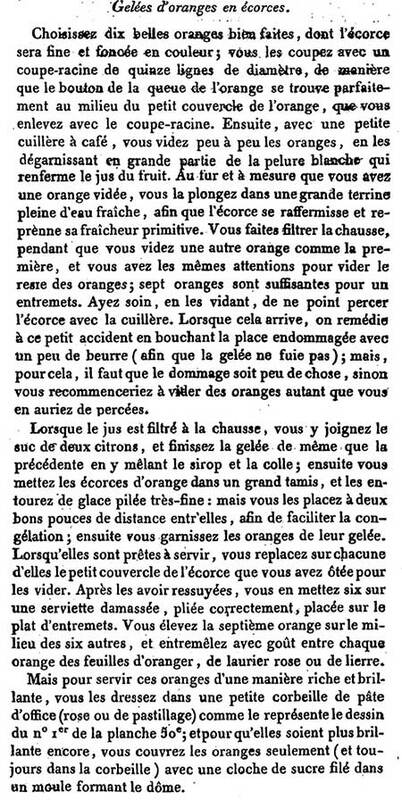 Here is Antonin Carême’s recipe for orange jelly inside whole orange skins from Patissier royal Parisien, 1815. He uses isinglass to set the juice into a jelly but you can use gelatin. Choose ten good oranges with a nice, deep color. 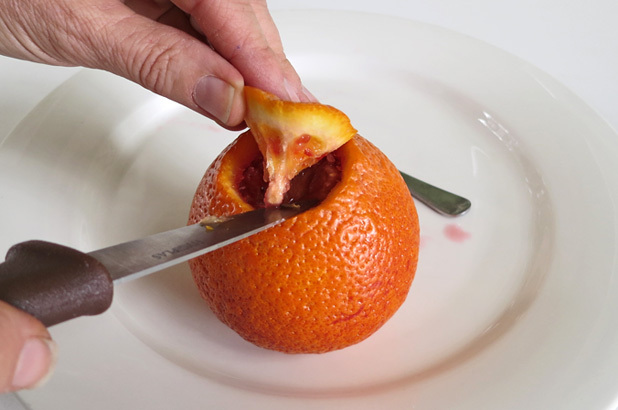 Cut a hole with a parer with a diameter of 3 centimeters, so that the stem of the orange is exactly in the center. Empty the orange, little by little with a small spoon. Submerge the emptied oranges at once in cold water, to firm up the skin and keep it fresh. Be careful not to break the skin with the spoon. If this happens, mend the damaged spot with some butter (to keep the jelly from running out). But that is only possible if the damage is small. Otherwise, empty new oranges, to replace the damaged ones. When the juice has been filtered, add the juice of two lemons, and syrup and isinglass. Then put the oranges in a large colander, and surround them with crushed ice. Keep two inches distance between the oranges to make the jelly set sooner. Then fill the oranges with the jelly. Before serving, replace the covers on the oranges. Wipe the oranges and place six of them on a beautifully pleated damask napkin, and the seventh slightly higher in the center. Decorate with orange leaves, oleander or ivy. For a splendid way of serving, place the oranges in a basket of confectionery, and to make it even more decorative, place a cloche of spun sugar over it.